Freedom: n. 1. the state of being free or at liberty rather than in confinement or under physical restraint. 2. the power to determine action without restraint. 3. personal liberty. 4. the right to enjoy all the privileges or special rights of membership in a community. Freedom is what makes America great. It is provided for in this country’s constitution, and it is the very foundation of our society. It’s also something we as Americans take for granted far too often. Last year, we were reminded of our freedom when we were attacked by those misguided individuals who felt the Western world allowed too much of it. And our government responded by reducing our own personal liberties. In other words, there is no better time for a frank and forthright discussion of what America is and what it means — all of which can be summed up in a single word: freedom. 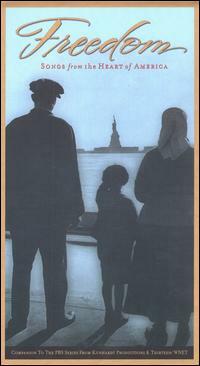 This is the subject for the upcoming PBS documentary airing in January 2003 — Freedom: A History of US. The 8-hour, 16-episode television series is a companion piece to Joy Hakim’s book of the same title. Further adding to the dialogue is Freedom: Songs from the Heart of America, a 67-track compilation that spans three discs and features music heard on the PBS program as well as a wealth of complementary material from Columbia Records’ vast archives. The album tells the tale of America’s rich heritage while touching upon as broad a range of musical styles as one can imagine. Blues, country, jazz, gospel, folk, classical, pop, soul, Broadway, R&B, and rock ’n‘ roll — it’s all here, suitably arranged to educate the listener about America’s history as well as its musical legacy. Bob Dylan warns that The Times They Are A-Changin’. The Broadway Quartet gets patriotic on Yankee Doodle. Dan Zanes and Suzanne Vega educate on Eric Canal. On Strange Fruit, Billie Holiday hauntingly relays the horrific sight of lynchings in the South. Billy Joel pays tribute to the camaraderie and brotherhood of American soldiers on Goodnight Saigon. Martha Reeves & the Vandellas celebrates by Dancing in the Street. Gene Autry croons Home on the Range. And on I Wish I Knew How It Feels to Be Free, Nina Simone prays for all those without liberty. There are many more songs on this set too — all of which serve the subject well. As a result, Freedom: Songs from the Heart of America serves to educate the masses on the history and very foundation of the United States as well as on the interconnected nature of art and freedom. Use it. Discuss it. Cherish it. But by all means, don’t ignore it. Don’t take it for granted. And don’t let anyone — outside or inside this country — take it away.